November 17, 2009 – In football, everything is about positioning. On the field, this can take the form of various offensive and defensive formations, the punt, pass, or kick, or just the mentality with which a team approaches its games. Off the field, however, positioning in the context of football has a much broader interpretation, especially with regard to levels of competition. 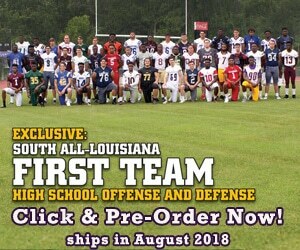 Louisiana high school football is divided into 9 districts and 5 highly competitive divisions, some of which frequently overlap, resulting in intensified play and heightened expectations. And no one understands this better than Wayne Reese, head coach of 4A McDonogh 35 Roneagles in New Orleans. While many high school coaches fundamentally grasp the importance of measuring up in inter-divisional play, Coach Reese has experienced it firsthand from his days as a running back at Tennessee State College and his stint in the NFL with the Los Angeles Rams. His experience in ascending the ranks of football has integrated itself into his coaching philosophy, which has little concern for the assigned divisional status that teams get based on school size. According to Coach Reese, “those kinds of numbers make you 4A or 5A, not a good football team. The measure of a good football team comes from matchups with those 5A programs.” Simply put, Coach Reese believes his team can hang with the best of them, having battled hard against 5A powerhouses St. Augustine and Thibodeaux this year, with the margins of victory totaling 3 points between those two games. So what is it that allows a 4A team like the Roneagles to compete at a higher level? It all goes back to positioning, in this case, incorporating the intangible elements of the competition into an already successful football program. While he is unconcerned with the 4A status of his team, Coach Reese nonetheless emphasizes “the importance of getting support from students, as exemplified by the 5A teams, and their program history.” In other words, to beat the best, you have to think and act like the best, and the Roneagles thrive on the hype that accompanies matchups with 5A schools. This philosophy has been highly motivation for the Roneagle players, who retain just six starting seniors that have stepped up big in the 5A showdowns. Players like Chad Griffin, a triple threat at tight end, fullback, and defensive end who has been widely recruited statewide, and Kenneth Welcome, a defensive tackle committed to Tulane, have been heavily impacted by Coach Reese’s motivational philosophy against 5A opponents. These guys have truly “measured up” against the big boys, and unsurprisingly they are also amongst the top academic performers in their classes, with grade point averages well above 3.0 And while Coach Reese is extremely gifted at inciting his team on the field, he prides his players on their academic achievements, dispelling the notion that “scholars can’t be athletes.” His players who have positioned themselves as academic leaders have consequently set the tone for their younger teammates in the classroom and on the gridiron. So here’s a friendly warning for all 5A football fans: watch out. The 4A McDonogh Roneagles can fly with the best of them.